In this mass participation event you can either ride or race, its up to you. The course follows through the scenic Mt Disappointment state forest over 90kms / 65kms / 30kms with plenty of undulating and ever changing road terrain. There is NO single track, but that’s not why you’re here. Its an event for the masses. Never been off road before, want something more exciting than a road race or do you just want to enjoy a fully supported ride with friends and family. The Dirty Gran Fondo is all of the above. Entry is according to the bike you choose to ride. Choose either Mountain Bike, Cyclo Cross or Mongrel (anything else). 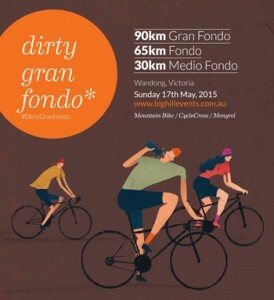 Choose your ride and join us a the Dirty Gran Fondo.